Author and philanthropist Paul David Pope has long been a popular figure in South Florida, and he doesn’t plan to shy away from the spotlight. Heir to the National Enquirer, founded by his father, Generoso, the Fort Lauderdale resident is busy adding a few more lines to his resume. Following 2010’s successful and salacious “The Deeds of My Fathers: How My Grandfather and Father Built New York and Created the Tabloid World of Today”, Pope is set to release another juicy tell-all early next year. In “Confessions”, Pope promises to divulge even more secrets. “The book is a natural progression,” says Pope of the sequel, which he has worked on for the past decade, on and off. It continues where Pope left off with the story of his father and grandfather (Generoso Sr.). In “Deed”, which Publishers Weekly named “among the best portraits of Italian-American life to appear in some time,” Pope explores life in 20th-century New York and offers a behind-the-scenes look into organized crime and politics in the Big Apple. Utilizing more than 500 interviews and archive sources, the book also chronicles the rise of tabloid media, thanks, in part, to the Pope family. Pope promises that “Confessions: will pack a punch – and no stone will be left unturned. “You’re getting more behind the story than you did in ‘Deeds’,” he says. “More of the CIA, FBI files, more from the archives, more of my life”. While Pope prepares for the book’s release, he’s also setting his sights on Hollywood. 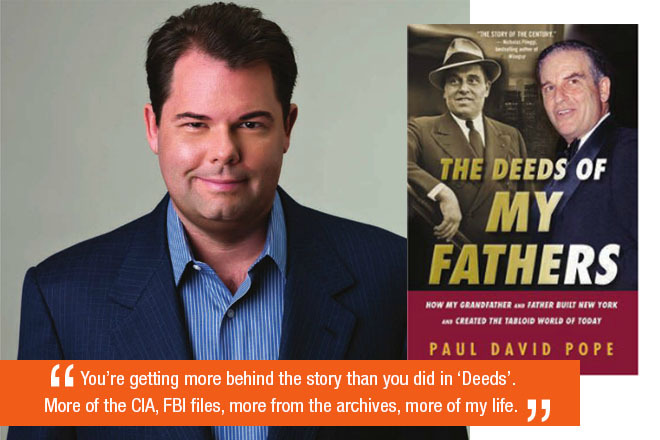 “Deeds” will hit the big and small screens within the next few years. It’s currently in development, with Pope acting as a consultant and co-producer for the project. Pope has also been busy collaborating on “The Italian Americans”, a new two-prat, four hour PBS documentary series. It was written and produced by John Maggio and explores the culture of Italian-Americans from the 19th century to today. “The series spotlights Pope’s grandfather, a newspaper publisher and owner of the largest sand and gravel company in the country. “Confessions” won’t be the last book for Pope. He plans on releasing another volume – an uncensored version of “Deeds” – shortly after to complete his trilogy. In addition to writing and producing, Pope is also working on a humanitarian effort, “Save Our World”, which seeks to educate people on the world’s problems and to fix them using real solutions.